A month ago it seemed that my sailing adventures were fading into the haze of time, and I was seized by a panic that I would have no plan for escaping the Maine winter, and no next voyage to be my waypoint on the course to the happy future. Perhaps another way of saying it is…I was bored. So, naturally, I turned to the Internet. 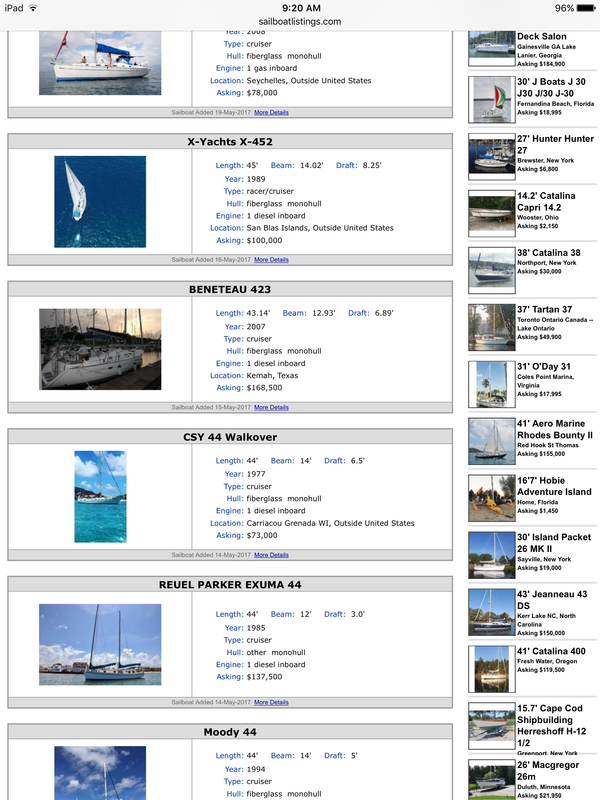 I found a great site for used sailboat listings, and I thought: I can probably find an older oddball trimaran, maybe 35′, for not too much money, that I could park in FL and sail to the Bahamas when I’ve had enough of winter. And when I’ve had enough warmth I can park it in FL again until the next winter. I found a possible match, located just a few miles away. The listing was dated two years ago, which didn’t bode well, but I sent an email to the owner and five minutes later he was calling me. Turns out he has an addiction to trimarans. When he likes one he buys it, even though he owns too many already. So he lists each for sale right away, knowing that he will have to sell one of the fleet at some point in order to afford the next! In any case, I went to look at the one nearby, and found that it was way too much of a “project” to serve my needs. The Reuel Parker one, of course. Why? Not because I thought I wanted to own an old sharpie schooner! 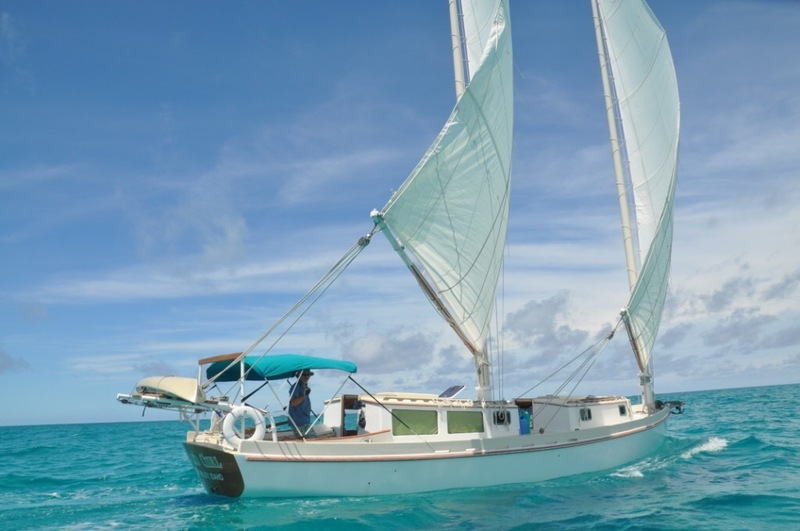 But because when Liam was sailing with me some months ago, he had introduced me to Reuel Parker designs, which were at the top of his dreamboat list. I recognized the thumbnail photo as a Parker boat, and I thought of Liam, and for the heck of it I clicked the More Details button. And for some inexplicable reason I took it a step further and sent an email off to the owner, saying: nice boat, but you are asking too much given the boat’s age and construction. (Given how many ads I had looked at, I now considered myself an expert on such matters!) To my surprise I not only got an email right back, but it said I was right, and they (there were two owners) had just reduced the price to $89K. They sent dozens of photos. Appealing, but what I saw was gobs of maintenance. I just wanted to fly to FL and go sailing, not keep up the brightwork on a wooden boat. When I said so, I got an intriguing response. After explaining that much of the “brightwork” was in fact epoxy paint, John suggested that there was no reason to include Florida in the plan. 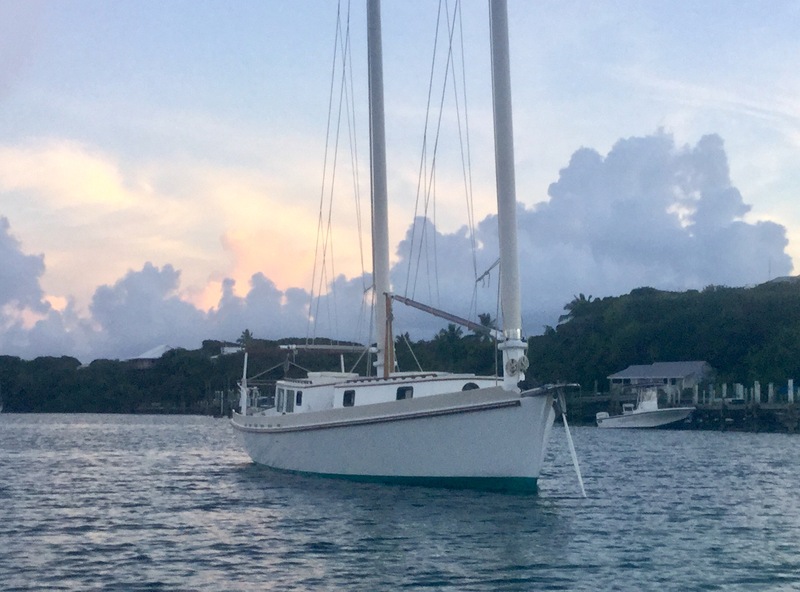 They had a perfect place to keep the boat in the Abacos, they had a fabulous boatkeeper who did better work than anyone in the USA and for less money, and there was a boatyard there that would handle common needs. Why not leave the boat in the Bahamas, safe and well cared for? What started as a lark was holding my attention. So I went a step further and asked if maybe they didn’t really want to sell the boat, and instead I might buy a half share, since I would only want to use it for a few weeks in the winter. I won’t relay the long conversation that ensued, but the bottom line is yes, we could do a partnership, but only with the understanding that I would buy 100% within two years. And they would be happy to introduce me to the local Bahamians that I should know. 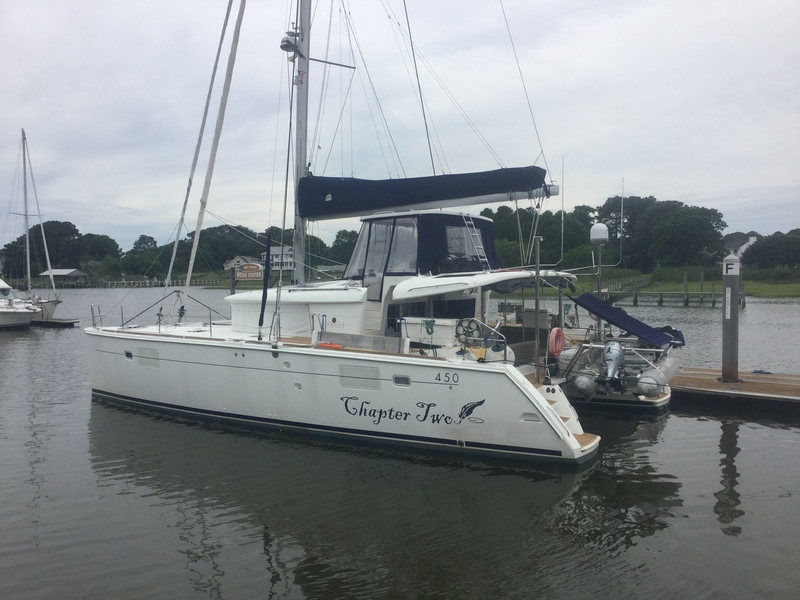 I haven’t mentioned that in June I crewed aboard the palacial Chapter Two, on a short passage from Charleston to the Chesapeake. I thoroughly enjoyed my time aboard Pat and Janet’s floating home. I went for three days. 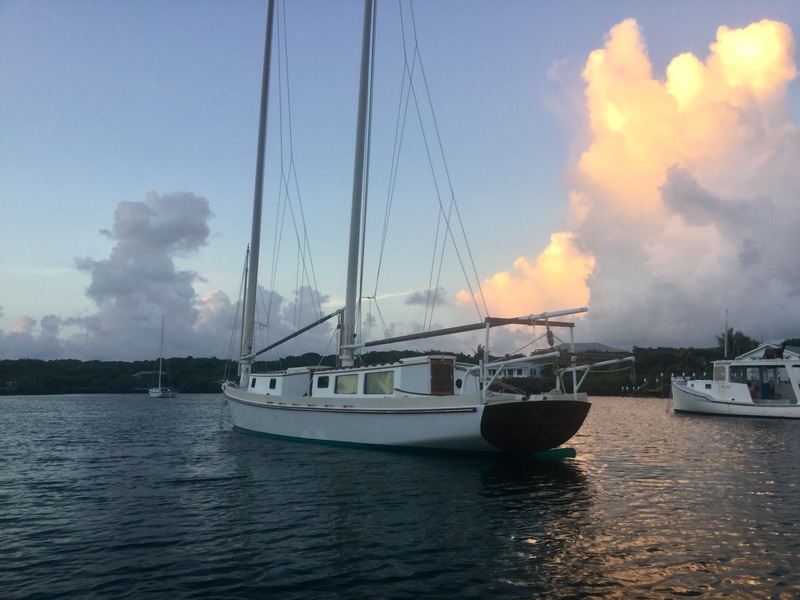 Two of the nights I stayed alone aboard Teresa (on the mooring; she’s all put away for hurricane season, sails taken off, etc). The third night I spent at Tom’s (second owner) cottage on Green Turtle Cay. Tom picked me up with a rented speedboat, and gave me a quick tour of the Abacos as well as feeding me lobster and grouper in his delightful little island cottage. So, back home again, here’s my take-away. The boat is cool; she has “heart.” Nothing like what I was looking for, of course; it feels more like Teresa was looking for me! But she’s not the sort of boat where Hallie and I would enjoy spending a couple of months together. First and foremost, her accommodations would not work for inviting another couple to join us. And they would be perhaps too “rustic” even for the two of us. So I told Tom and John that I need to go back to the drawing board, and together with Hallie figure out what adventures we will embark upon. Reluctantly, I said goodbye to Teresa. The end. Maybe… The thing is, Hallie and I did have a talk about future winter adventures, and we decided that…at least for now…there isn’t just one answer. There isn’t one ideal boat we want to live on. There isn’t one ideal place we want to be. For now we will dream up new smaller adventures as we go. This winter we’d like to visit New Zealand. And maybe try out a week at an AirB&B in the SE USA. Maybe try St Augustine. So forget searching for the one right answer. But…I still want to do some sailing, with or without Hallie, with or without guests. Why not…Teresa? Her price is rather high for just occasional use. But…what about a partnership…? If I could find one or two partners to share the cost/use, she could still be a unique and happy opportunity. Love this Zeke. From one dreamer to another. I am sitting home, after getting home from church, and there you are, makes me giggle…just so because I look forward to your writings. What a dilemma! it is a mystery, and mysteries lead to adventures. All the best. 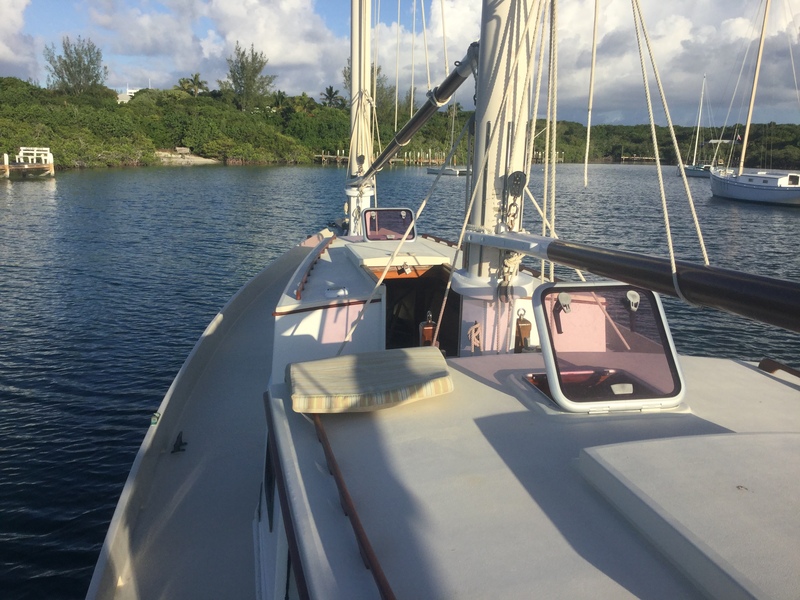 Zeke – I’m not interested in buying a boat, but reading your post made me think of my sister and her partner who are currently living on a 47 ft motor sailer at a boatyard in Falmouth, ME. They are trying to sell their house in NH,sail this boat down the inland waterway in late October. And dock it somewhere in Florida for the winter. I think you are currently very near Falmouth, so if you’re bored and feel like looking at a boat (not currently for sale, but you never know!) that sleeps 4 just because you like boats(! ), let me know and I’ll give you their contact information. P.s. Loved following your journey!! What an experience! This post, like many on the blog, makes me wish I were a sailor. But even more so, it makes me wish I were retired, which is a much more likely situation to materialize in the future. Hi Zeke. I am also a Chris White boat admirer, and have enjoyed your blog from start to date. I note your MUCH more relaxed frame if mind in your earlier blogs, and hope that you can refind that peace and sense of purpose. You have much to give. My home is for sale and hope that ‘my’ boat will then appear; at present an Atlantic 48. Re your search, why not one of Chris’s ‘Juniper’s, assuming and hopefully the first having survived the recent hurricanes? ?